Admire some great British and international art on this private tour of London’s Tate Britain and Tate Modern. With an art-expert guide, admire each gallery’s highlights, and enjoy a sightseeing boat trip along the Thames River in between. Visit the Tate Britain, home to Britain’s national collection of paintings from the 16th century to ogle masterpieces by Turner, Constable, Hockney and others. Later, explore the spectacular Tate Modern and see pieces by artists such as Picasso, Matisse, Rothko and more as your guide provides expert insight into each. Make your own way to the Tate Britain in central London and meet your private, art historian guide. The recently revamped gallery contains the national collection of British art from the 16th century, with works by Constable, Gainsborough, Whistler, Hogarth and more, including contemporary painters. It’s also home to the world’s largest collection by JMW Turner, Britain’s greatest 19th-century landscape painter. Head inside and view the main highlights. Admire works by artists such as Hogarth, Rossetti, Hockney and Bacon, among others, and explore the Turner collection of 300 works the artist bequeathed to the nation, including masterpieces such as Norham Castle, Sunrise and Rome, from the Vatican. Afterward, take a boat trip along the Thames River. Soak up views of London landmarks such as St Paul’s Cathedral and the Millennium Bridge, and alight on the South Bank at Tate Modern, converted from the Bankside Power Station in the 1990s. Ogle the spectacular Turbine Hall and other spaces of this once-industrial building, and take in seminal pieces by greats such as Warhol, Picasso, Cezanne and Rothko as your guide explains their meanings and backstories. At both galleries, your guide can customize your tour to suit your personal interests, and will share their expert perspective on what you see. List any personal interests you have (such as particular artists, periods or styles) when you book so your guide can prepare for your tour. 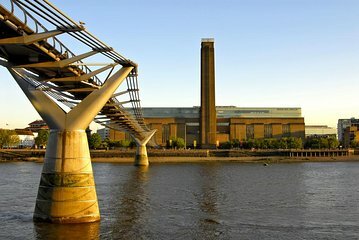 After your tour, say goodbye to your guide at the Tate Modern and either continue to explore the gallery independently or leave and continue your day in London. Our guide, Paul, was very knowledgeable and gave us much insight into the paintings, artists and events occurring in history at the time of the paintings. He also gave us recommendations to find more info on our favorite artists. I highly recommend this tour and Paul. It was fun, educational and very thorough. I paid a lot of money for this tour. I expected a minimum of 2 hours at easy museum not including transporting from one to another. It was marketed as all day. But it was only 3 hours in total. Superb knowledge, excellent pacing and use of time. Spoke clearly, open to new ideas/interpretations. We learned so much! Highly recommend Marguerite! Artstur! Marguerite was an excellent guide. I felt both Tate's were inferior to the National Gallery and next time will just go there. The Turner's were superb.